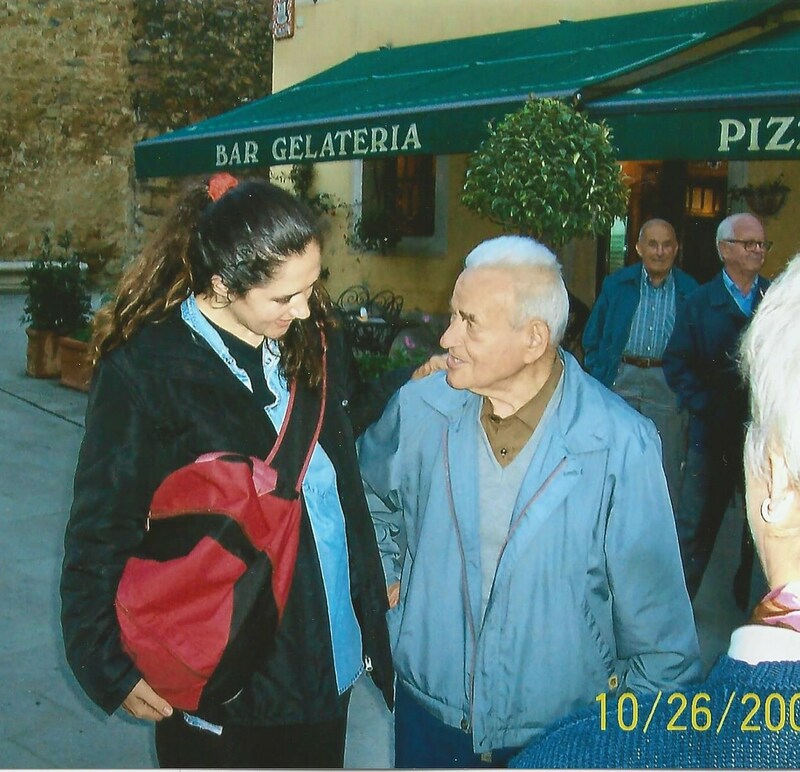 In October 2005, Hub and I joined some friends on a 16-person tour in the Tuscany region of Italy. About 15 minutes after we left Florence on our way to Siena, our bus driver turned off Via Cassia and headed down a spacious driveway bordered by well-manicured lawn and stately trees. Our guide, Marie Elena, announced she had a ‘little surprise stop’ for us. As we departed the bus, we found we had entered the grounds of the Florence American Cemetery and Memorial, a 70-acre piece of land given to the United States by Italy as a permanent burial site for United States military personnel killed in nearby World War II battles during the first half of 1944 (who were originally buried in temporary sites). This cemetery is one of 20 permanent American World War I and World War II military cemetery memorials established on foreign soil by the American Battle Monuments Commission. 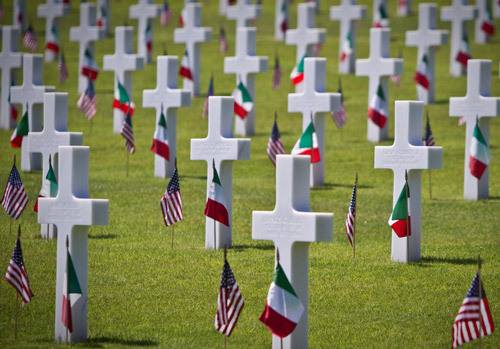 The use of these permanent cemetery sites – located in France, England, Belgium, Italy, Luxembourg, Republic of the Philippines, Holland and Tunisia – was granted in perpetuity by each of these host countries to the United States. The Florence American Cemetery holds 4,402 gravesites of men and women who served in the United States military from the Philippine Islands, China, Turkey, Spain, Washington, DC and every state except Alaska. There are several headstones marking graves of Unknowns, and five pairs of brothers buried side by side. I’m embarrassed to say I knew little about our military cemeteries overseas. 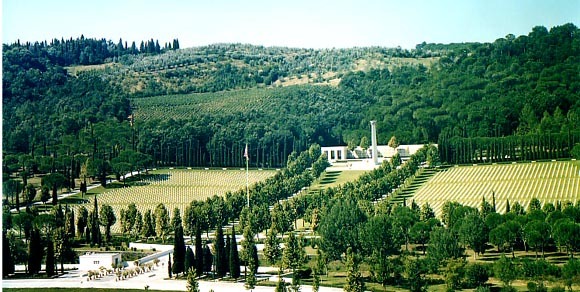 Until that visit to the Florence American Cemetery, I gave little thought to the families of men and women whose bodies were never returned to the States for burial in family plots. And yet they rest for eternity on land dedicated forever to the memory of their sacrifice. Leaving the cemetery was not the last time Marie Elena spoke of the American military personnel, in particular those serving in World War II. In numerous hillside villages, she pointed out churches, bridges, and important roads, telling us the Allies saved them from ruin or had a hand in rebuilding. She ushered us to one small village where her Uncle and his friends were sitting at the outdoor café having their morning coffee. She wanted us to meet her Uncle because he had fought ‘alongside the Allies’ is how she worded it. Uncle and his friends thanked us in rudimentary English for saving their village. For me, World War I is a chapter in the history book and World War II is living history that will become just as distant for younger generations as the last of its surviving veterans come to the end of their lives. I am grateful to Marie Elena for teaching me something about my country’s history, and for expressing her gratitude for the sacrifices made by our military personnel. As we make time this Memorial Day to honor and remember those who gave their lives, we honor those buried near and far as well as those whose remains have never been found or identified. God Bless all our military familes, past present and future. That was a special stop for sure. I know little about those overseas military cemeteries either, so this was nice to read. Thanks for increasing our awareness and have a good rest of your weekend! Great post. I had the honor of visiting the American Cemetary in Normandy France several years ago. It was an experience I’ll never forget. God Bless al who served and lost their lives for freedom. Thank you, George. It is indeed an honor to be able to visit these special places. Memorial Day is very important to our family. Thanks Sammy. I knew there were cemeteries overseas but that’s about it. I liked learning more about this subject and I hope people will continue to share posts like this so that we can keep these memories alive. We owe so many people at least that much. Thank you, Dan. I, too, hope we continue to instill a sense of honor, duty and gratitude in younger generations. If we are able to resolve conflicts without war, all the better. The men and women who gave their lives were instrumental in making sure future generations have an opportunity to do just that. We must never forget them. Great post! I fear that we’ve lost sight of what Memorial Day is really about. When I hear people say “happy Memorial Day” (as if it’s a celebration) it doesn’t sound right to my ears. We don’t need to remain somber all day but it would be nice if we all took a moment to give thanks for those who made the ultimate sacrifice for us. I know, Janis. Speak to anyone serving in the military and they find it offensive (or at least ill-informed) when someone says that to them. On the other hand, they agree it’s nice people at least make a connection to Memorial Day being ‘some kind of’ military holiday. I am always so touched by the families who do come to our National Cemeteries on Memorial Day. Our lives woukd be vastly different if history had gone another direction. Thank you for honoring our servicemen and women. That was educational for me. Lovely photo. I’m hopeful that as her studies of history go on, she’ll realize the past wasn’t so far away. Thanks for continuing to educate, Joey. My Dad speaks to high school seniors each May (the school has a representative from each war and each military branch come for q & a), and he said they are all taken aback when he tells them that the boys in the class would be heading to war as soon as they graduate if they’d been seniors in his class! No summer vacation; no college or job plans. Directly to boot camp and overseas to fight in Europe or the Pavific Islands. Justine it’s always good to hear from you and I can see from your blog how many projects you have going on. Take care, Sweetie ! Thank you, Sammy. This is a beautiful tribute to those who lost their lives overseas. I didn’t even know these cemeteries existed until I read this post! As I prepare for the Memorial Day events tomorrow, I’m so glad you reminded me what the holiday is truly about. Thank you, Jen. I am always learning new information about the selfless service others have given, and it was truly heartwarming to see such appreciation in Italy. I hope you enjoy tomorrow. Absolutely beautiful post, Sammy. I didn’t know that there were these cemeteries overseas. You’ve made a really nice tribute to those soldiers and their families. Thank you for the reminder of what we should all be thinking of on this day. Thank you, Kelli. Memorial Day is a day very close to my heart. We don’t celebrate Memorial Day but we do Remembrance Day on November 11. These are important “holidays” and frankly, many special days are just regarded as days off work for too many people. Dale, I bet Canada does. Marie Elena told us italy gave land to several countries but none to Germany! Your Remembrance Day coincides with our Veterans’ Day on Nov. 11. That Day we honor all Vets whereas Memorial Day honors those who gave their lives. I revisited this post to show my husband because I thought it was such a unique and wonderful take on Memorial Day. He was touched. And the pic of your tour guide’s uncle looks just like my husband’s grandfather. Crazy. Lovely as always, Mom. What a special visit this would have been. Meeting Marie Elena’s Uncle must have made the experience so memorable and brought home the sacrifice of those who battled. Yes, it was memorable. Thanks, Sue! What an amazing experience, Sammy. I am a history buff, especially the WWII era, so I would have loved to be there. Thank you, Dani. There are many good blogs for WWII buffs. I follow a couple and learn more each time i read a post. I’m glad you have an interest in it. Dad and my Uncles fought in the Pacific with the Marines. My grandfather’s both fought, as well. My paternal grandfather served as boots on the ground in the Philippines and my maternal grandfather was a fighter pilot in Europe. Dani, it was such an unusual time to have our nation’s young men and women going to war on two very different fronts against very different enemies and in such varied terrain. God Bless them all. Wow, I knew absolutely nothing about such beautiful cemetery overseas and the generous tributes, although it made perfect sense as I read your post. Thank you, Sammy. God bless them, indeed. There is no greater sacrifice for the servicemen and women and for their families, especially for those left behind. We watched American Sniper a few days ago, and it brought it all into focus. A most excellent post and love the photography. Thank you, Silvia. I’m glad you saw the movie; the current military members I stay in touch with all saud it was a very accurate portrayal of the place and the missions. A heart break for so many, Sammy! I can’t imagine a son not ‘coming home’. That was a very special stop indeed — I did know of cemeteries in France dedicated to the British, the Americans, but I imagine there must be these kinds of cemeteries scattered over Europe. So many people who didn’t make it home, it must have been heart breaking for so many families. Thank you, Celine for sharing your gratitude. Most of them were so very young when they died. I did not know there were cemeteries overseas for the fallen American military. Thank you for the education. I had a hard time accepting that so many families never had their loved ones’ remains returned to them, but given the sheer numbers and circumstances, it finally made sense to me. I’m relieved they have such beautiful, dignified resting places. I can see why it was done, but if I were one of the family members, I would have a hard time with it, too. I wouldn’t be able to visit the grave sites and pay my respects, as I like to do on Memorial Day, and other days. It would be sad to be so far away. Exactly! Perhaps it was a matter of timing, priorities and keeping comrades together. I don’t really know anyone to ask about it ( All relatives were fighting in Pacific) but I will find a vet or two eho fought in Europesn theater to see what they say. It’s also possible that a second headstone was placed in a cemetery here in the States if families wished. I wonder. If you find out an answer, I hope you’ll post it. I didn’t think about the fact that another headstone might be placed here in the U.S. That would, at least, be some consolation. Will let you know if I find out! So important to have these memorials and rituals such as in the US. On the 11th Nov every year Remembrance Day is observed by countries in the Commonwealth as a reminder of the armed forces who lost their lives. WW1 came to an end in 1918 on the 11th hour of the 11th day of the 11th month. A few years back I visited Vietnam, Cambodia and Laos, and I can’t remember in which city it was but we visited a most beautiful cemetery for those who had fallen – I took photos. I must seek them out. Thank you for your lovely post Sammy D. So great you’ve honoured them. Thank you, Susan. I thought of you while I wrote this because I remember learning about Remembrance Day from you last November 11, which is Veterans’ Day here in the States. I, for one, am grateful for the strong alliance we’ve had with Commonwealth nations during some very dark times. I would love to hear more about your trip to Cambodia, Laos and VietNam and see photos if you find them. I hope you do!